Yesterday, the New York Times ran an error-filled article on the indictment of Trump adviser George Papadopoulos that seemed intent on cementing the notion that Russia hacked thousands of emails from the Democratic National Committee (DNC) and then offered those hacked emails to the Trump campaign to smear dirt on Hillary Clinton during the 2016 presidential campaign. The problem was that the actual Federal indictment unsealed on Monday against Papadopoulos made no such claim regarding emails hacked at the Democratic National Committee. Where the thousands of emails referenced by the Russians actually came from was not spelled out in the indictment. They could have just as easily been emails hacked from Hillary Clinton’s unsecure server in the basement of her home during her time as Secretary of State. But Hillary Clinton actually is Public Enemy No. 1 to millions of Americans on both sides of the political aisle. Supporters of Senator Bernie Sanders have filed a Federal class action lawsuit (now on appeal) with strong evidentiary support to show that the Clinton campaign and the DNC conspired to undermine Sanders’ campaign – in direct violation of the DNC Charter which mandates fairness to all primary challengers. Wall Street On Parade is certainly no supporter of Donald Trump or Hillary Clinton. Both were the most unfavorable Presidential candidates in modern history as evidenced by respected polls taken prior to the election. 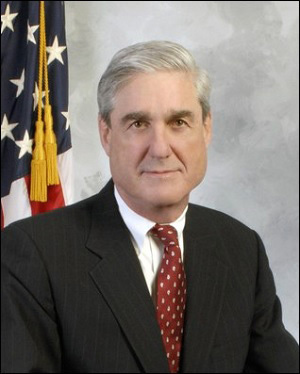 Looking at the facts on the ground in May of this year, we felt that Mueller, a partner at the corporate law firm, WilmerHale, immediately prior to his appointment, would be tainted by the legal representations of his law partners. As reported in March by Politico, a WilmerHale law partner, Jamie Gorelick, represented Trump’s daughter Ivanka and son-in-law Jared Kushner. According to the report, Gorelick also represented former Exxon CEO Rex Tillerson in his confirmation process to become Trump’s Secretary of State. As if those connections were not eye-popping enough, Gorelick had actually been an active supporter in Hillary Clinton’s 2016 campaign for President. The same month that Politico was calling out Gorelick’s ties to Trump and Clinton, American Lawyer reported that Paul Manafort, Trump’s former campaign adviser (who was just indicted by Mueller) was being represented by a top WilmerHale partner, Reginald Brown, chairman of the firm’s financial institutions group who also heads up the firm’s congressional investigations practice. Wall Street On Parade identified two more potential conflicts at WilmerHale. According to this Trump Transition Team roster at the corporate law firm, Steptoe & Johnson, Benjamin Powell, a partner at WilmerHale, served on the Trump transition team for the Office of the Director of National Intelligence. According to the roster, another WilmerHale partner, Matthew Martens, served on the Trump transition team for the Securities and Exchange Commission. What the New York Times continuously ignores is that the American people are disgusted with Washington’s revolving door and good-ole-boy mentality. When Special Counsels are appointed to investigate matters that are critical to the public interest, Americans don’t want that individual to come buried under either the perception, or the fact, of conflicts. Taking the New York Times word that Mueller’s work is “precise” and “methodical” and that he is “highly respected” is just not cutting it. Americans are demanding that they get transparency and conflict-free investigations as well as leaders in Washington who reflect the honesty and decency of average Americans. In years gone by, we thought about the New York Times as a newspaper in the same sense as we thought about democracy: it’s the worst form of government, except for all the others. Now, we no longer believe that the New York Times is the worst media outlet, except for all the others. The New York Times is headquartered in the same city that Wall Street calls home. Wall Street, in turn, mints the billionaires and millionaires that keep the city’s chic restaurants full, the real estate soaring, and the trendy stores bustling. All of this means big advertising bucks to the New York Times. Thus, we can’t help but wonder if a less than altruistic agenda played a role in the editorial page of the New York Times cheerleading over the years as an advocate for the worst financial and economic decision in U.S. banking history – to repeal the Glass-Steagall Act. The Glass-Steagall legislation had kept the U.S. financial system safe for 66 years until its repeal in 1999 by banning banks holding FDIC-insured deposits from being under the same roof with investment banks and brokerage firms that regularly gambled for the house and blew themselves up. Just nine years after the repeal of the legislation, the U.S. experienced the worst financial collapse since the Great Depression – the economic disaster that spawned the legislation in the first place in 1933. Both the Iraq war and the Wall Street financial collapse and government bailout of 2007-2010 have added trillions of dollars to our national debt. The Wall Street collapse and its related economic disasters have left this nation with a stunted annual growth rate of 2 percent or less since the crisis and our young people unable to find decent paying jobs. Senior citizens who were living on the interest income from 4 and 5 percent Certificates of Deposit before the crash have had to dramatically scale back their food purchases and other necessities to make up for their interest income being slashed in half as a result of the Federal Reserve keeping interest rates at close to the lowest levels in history — in an effort to repair the damage to the economy that Wall Street perpetrated. All of this should remind us that a powerful media outlet engaging in bad reporting and bad editorial calls can have critical consequences for this nation and our democracy. The problem is not just the Murdoch empire but the New York Times as well.